The night before a storm had started while we were having the barbecue and had raged all night while I comfortably slept tucked under a duvet hearing the rain pelting against the window and the roof. The following morning the sky was still covered in clouds and there was a forecast of rain at some time during the day, so I could not plan on venturing into the mountains and find some trails, everything was muddy and a few days ago one of the British girls who spent the summer in the village had had a fall while offroading and hurt her shoulder. I decided to pop into the Sevlievo, the nearest big town, to get some oil for the chain oiler and do some housekeeping on the bike. 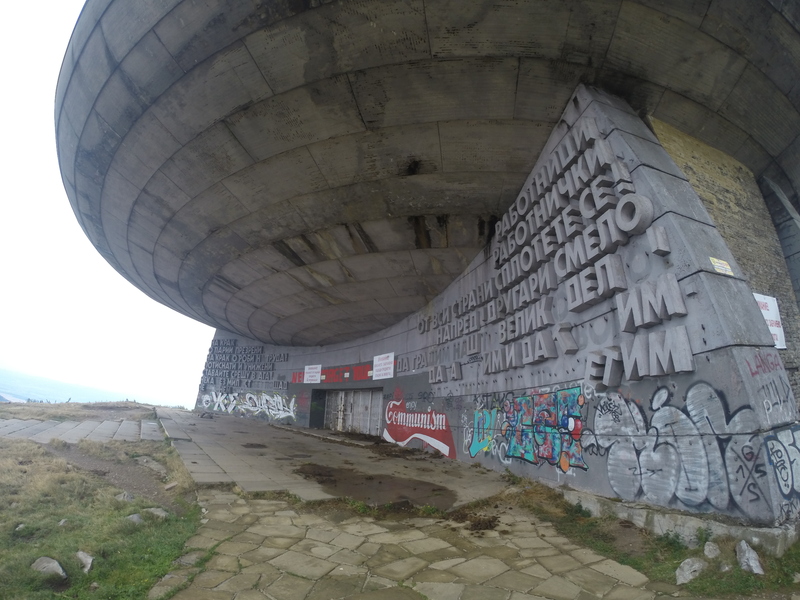 Once that was done the weather seemed to improve a bit, so I decided to go and visit Buzludzha, which was about 60km away by paved roads and it was something I really wanted to visit. 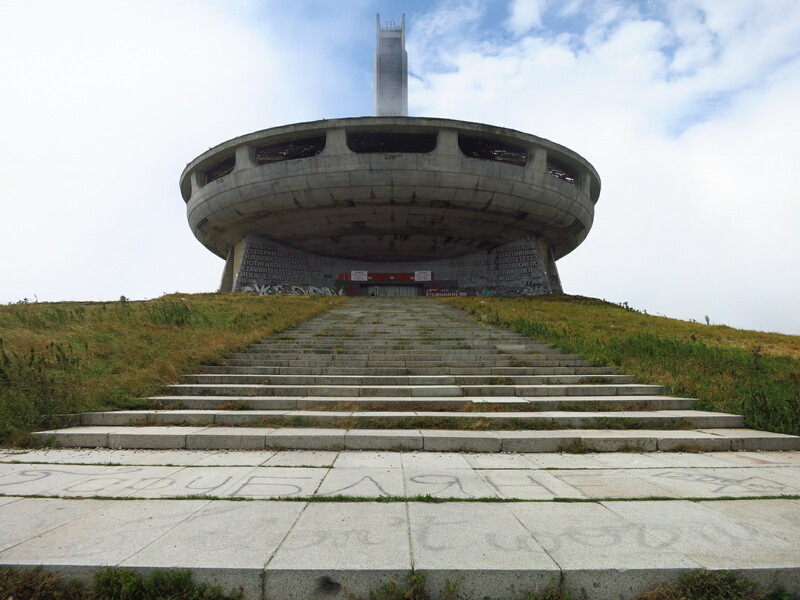 Buzludzha is not a town, but a mountain peak, and the reason I wanted to go there was not to do some hiking, but to visit the monument that is located at its top, more than 1400m above sea level. 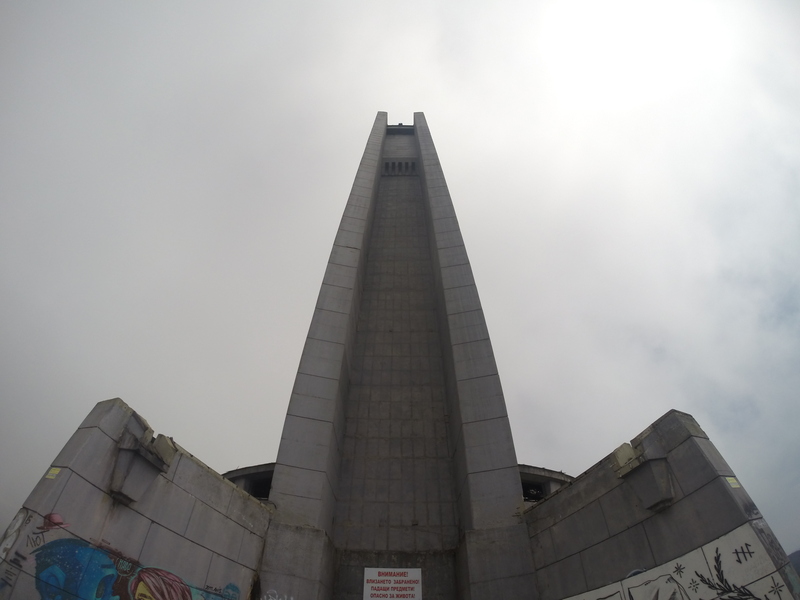 This is no ordinary monument, but a concrete monster built in 1981 to commemorate the founding of the Bulgarian Communist Party in a secret meeting that had taken place there a hundred years before. The building is an enormous round concrete structure that resembles a flying saucer with a high tower behind it, and it housed an arena intended for state functions and celebrations. 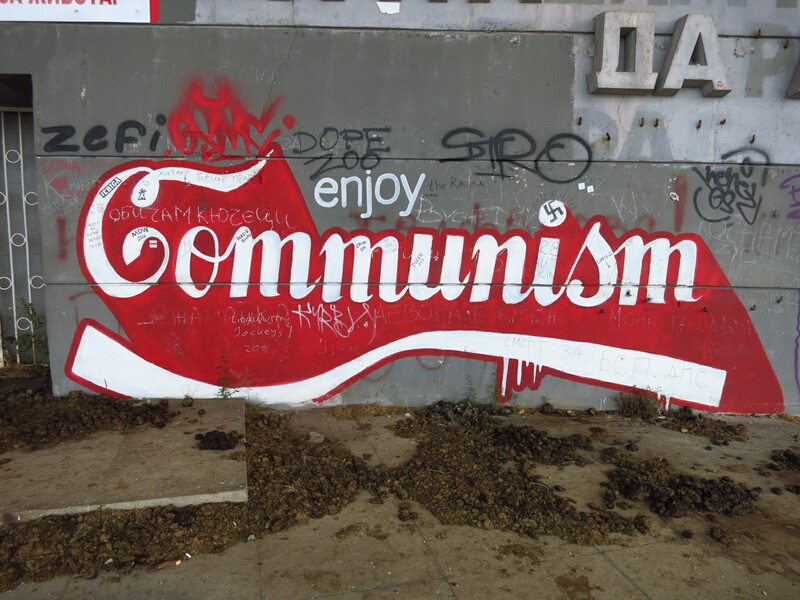 Not proud of its communist past, the Bulgarian government let the building fall into disrepair and now it sits slowly falling to pieces in the middle of nowhere. 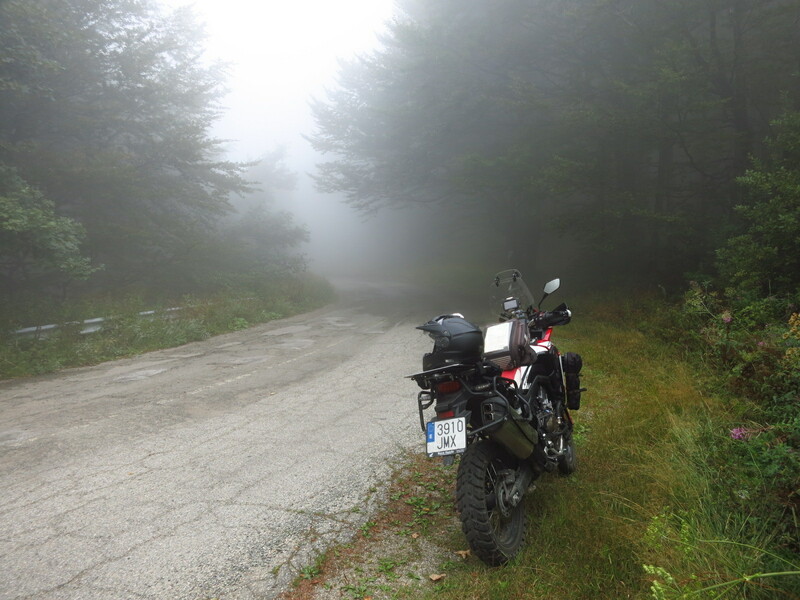 After riding up the Shipka pass, another amazing road to add to my list, I took a smaller road that led to the monument. This one was in quite bad conditions, possibly also forgotten by the government, as it only leads to the building. It was a rather heavy morning, and after some tight corners I reached a col from where the imposing structure first came into view. At the col there was another monumental construction, two hands holding torches, from where a footpath led up the mountain to the building. The road continued, though, so I went on until I reached the end of it at the foot of huge stairs that raised to the entrance. Up to no long ago, the building had been open, but in recent years the roof had deteriorated considerably, so the government had decided to weld the doors shut. Even so, people had managed to break through some window panes into the staircases, and from then on a kind of battle had been taking place – someone cut open the iron bars blocking access and a few days later the authorities would go and weld some new bars on. Being able to see the inside of the building was a matter of being lucky with your timing and going there at the right window of time. At the Motocamp, the latest info going round was that it had just been closed again, and sure enough, when I got there I could find no way of accessing the interior despite going round the building several times. I was very disappointed, but I have to admit that it was still very impressive from the outside. I escaped the rain on the way back made it to the camp dry, where I spent the rest of the day catching up on my writing and chatting to the people there. 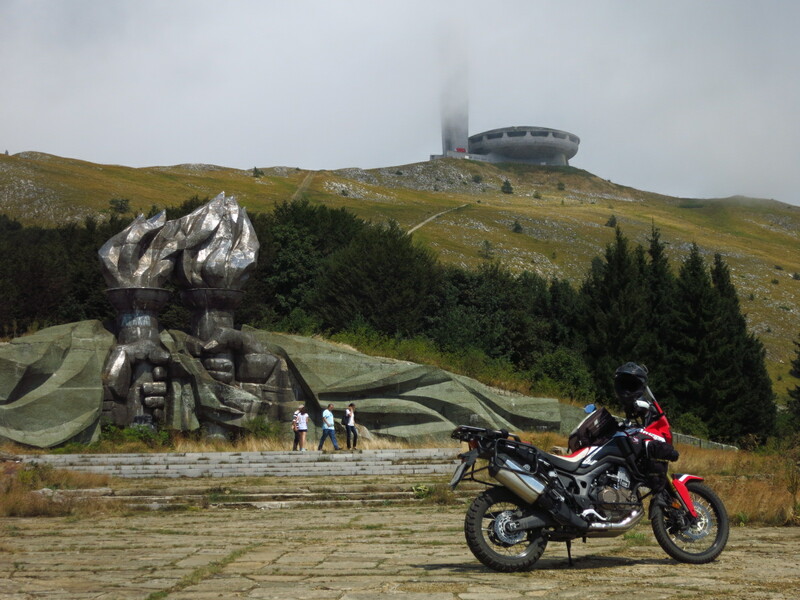 This entry was posted in Uncategorized and tagged Bulgaria, Buzluzdha, communist architecture, Honda CRF 1000L, Idilevo, Motocamp by Kilian. Bookmark the permalink.